Another Fan from the South Wales Valley's. Hi all, and thank's for your welcome to the Whispers forum. I first adopted "Gizmo the Git" from Eileen at friends of the animals rct, five years ago and it was a steep learning curve as to the way's of the Shih Tsu breed. He was around two years old and deeply traumatised, just like a human in a deep depression. With lots of love and encouragement, he has gradually turned into a wonderful friend and companion. For some time we thought that he would enjoy another of his own kind for company in the house and so we now have "Bella" a nine year old from the same rescue centre. She is an absolute treasure. We(my husband and i) hope to enjoy the Forum and share experiances as time goes by. Regards Stevie. Location : Hengoed Mid Glamorgan. Re: Another Fan from the South Wales Valley's. 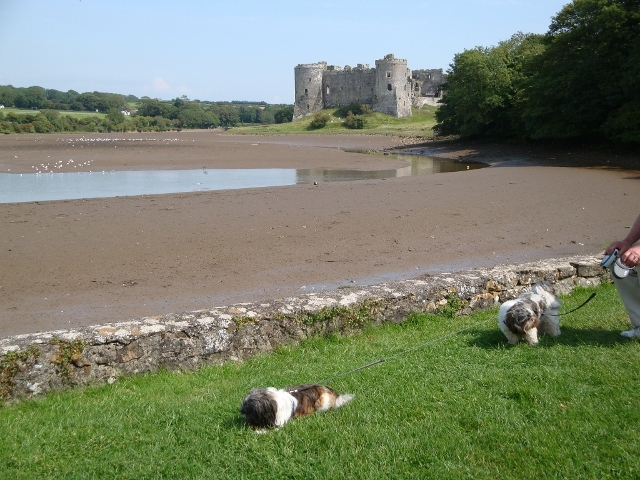 Photo taken at Carew Castle in Pembrokeshire on a walk yesterday. You are very welcome Stevie, there are quite a few of us in Wales. It would be very nice if you were able to make it to The Burns Dogs Day Out in Pembrey near Llanelli on 18th September. Organised by Burns Pet foods. It is a great day out with lots of doggy things to see and do and meet up with any one on Shih Tzu Whispers who can make it. Yours is a lovely story of how you came to have your two Shih Tzu's. I have two girls Mali who is 4years and Tasha who is almost 3 years. It is a wonderful breed which I wish I had discovered a long time ago. Look forward to hearing about your two and the things they get up to.